IPL Laser Treatment For Dark Circles Under Eyes is on option that some of the millions of people all over the world who are searching for a successful under eye circles treatment might consider. Dark undereye rings are normally caused by broken capillaries (blood vessels) in the lower eyelid. This causes a shadow, giving the skin below the eyes a dark appearance which no-one wants, because it makes the face look aged and tired. These shadows may be caused by a variety of factors, including genetics, exhaustion, vitamin deficiency, hyperpigmentation, an allergy and certain medical conditions. In many cases, they are simply an inevitable sign of aging. The delicate skin under the eyes becomes more transparent as people age, causing the blood vessels to become more noticeable. Dermatologists agree that IPL (Intense Pulsed Light) is the safest light-based treatment for this fragile part of the face. 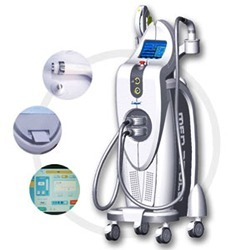 Intense pulsed light is used to increase collagen production in the skin area being treated. The light energy is converted to heat energy after it is absorbed into the skin cells. The process delivers several wavelengths within each pulse of light. Although this video does not specifically show IPL laser treatment on the undereye area, it does show the benefits that can be achieved for broken capillaries and hyperpigmentation on the face. As a non-ablative resurfacing procedure, IPL targets the lower layers of the skin (the dermis) and does not affect the top layers of the skin (the epidermis). This is why the results are not likely to be as dramatic as with an ablative resurfacing treatment. However, the main advantage of IPL is that there is no recovery time, meaning you could have the treatment carried out during your lunch break and go straight back to work. Most patients have 4-6 sessions, a few weeks apart, to achieve the best possible results. Why you should treat dark shadows as an early warning system! As with all aesthetic treatments, it is important to take some precautions both before and after the procedure to ensure that your skin is protected. You should avoid sun exposure for a few weeks before and after the treatment. Side effects of IPL laser treatment for dark circles under eyes should be minor and temporary, and may include bruising to the area being treated, temporary white patches on the skin, sore, pink, tender skin immediately after the treatment, and the sensation of mild sunburn for a short time after the procedure.